Hi everybody. 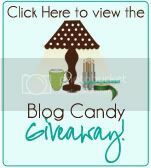 Before I reveal my card to you, I'd like to share with you some blog candy that I have on my blog with a deadline of April 15. I am giving away a Personal Cricut Machine! I hope that you enter your name for a chance to win! I have an InLinkz set up so all you have to do is enter your name. In order to redeem myself from last week's disaster, I thought that I'd put a fun spin on this week's sketch challenge. Instead of using scallops, I used a Filigree Border that really put an elegant touch to this card. It was a very fun surprise to find out that while picking my lamp shade, the filigree design was incorporated into that, so of course I used it. I cut four full lengths of the Filigree border and added a 1/8" piece of Scor-Tape to the bottom of each. While working from the right side of the card to the left putting down my borders, I staggered them as Natasha suggested so that every other border was aligned to get the full effect of the pattern. I then spritzed the card with a mist or two of glimmer mist to tie the image (light/shine) in. I die-cut my images and sentiment, and then stamped them. The final step was adhering them to the card with foam dots. I hope that you like this card and that it provides you with some inspiration. Enjoy! This turned out GORGEOUS! Like a filagree overlay! It's a great looking card and wonderful inspiration. Wow! This is wonderful! 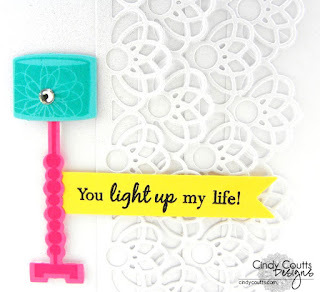 I love the way you used the filagree border - way outside the box! Love the colors too. Just marvelous! pretty card! I like how you layered the filigree border. that is a super cute cut! i'd like to try something like this... always need to find ways to make my cricut work for me! Love the Filigree border. Pretty card.